The new Gotthard train tunnel is going to be opened soon. Plenty of steel tracks, cables, catenary and telephones were installed before the first test run happened. 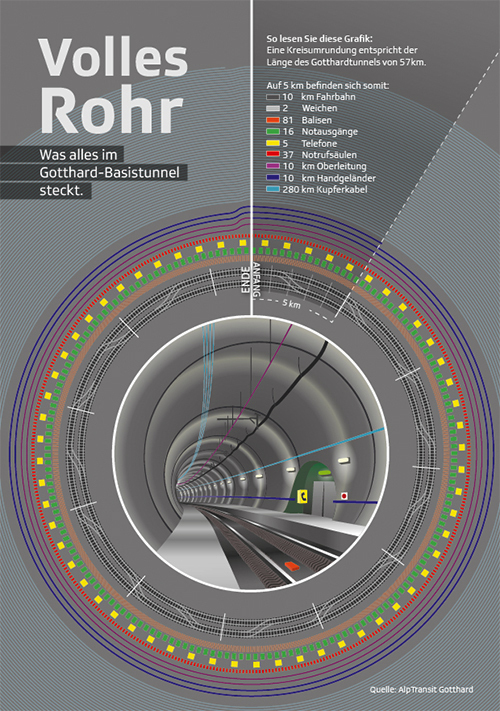 The infographic shows how many components were placed in the 57 km long tunnel. How you read the graphic: One full circle equals 57 km, which is the length of the tunnel. For example, the dark blue line represents the length of the handrail, which is 2.2 times the length of the tunnel. The yellow squares represent telephones, so within 5 km of the tunnel, you can find 5 telephones. All elements are displayed in the circle in the middle, for more information you can click on it.